Geraldine (Jerrie) Mock, "The Flying Housewife" made aviation history fifty years ago, becoming the first woman to circumnavigate the globe solo in an airplane. And due to the time period in which she achieved her record, she passed away on Tuesday at age 88, having never received the fame that she deserves. Jerrie was from an Ohio town called Bexley, near Columbus. She took her first flight at age five, in a Ford Trimotor. Yes that's right. Ford built planes! She was also married to a pilot, which helped boost her passion for aviation. She was a typical housewife and mother of three, who at age 38 decided to plan an around-the-world flight because she "just wanted to see the world." 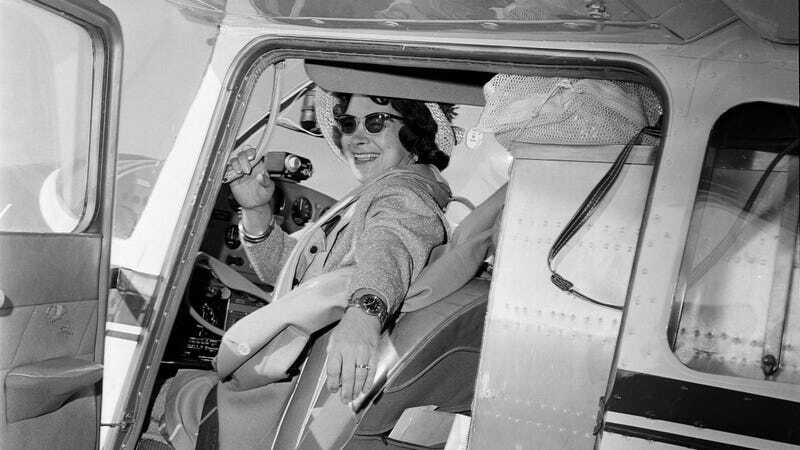 Another female pilot named Joan Merriam Smith was also planning a similar feat, and when Jerrie heard about Joan's plan, she bumped up the date of her tour by a couple weeks, according to the Smithsonian. Armed with only 750 hours of flight time and virtually no over-water experience, Jerrie took off from Port Columbus airport on March 19, 1964, in a 1953 Cessna 180. The plane had its passenger seats removed, and three extra fuel tanks were installed in their place, which boosted its range to 3,500 miles. It also had a new 225 horsepower engine, installed by her husband. At a time when men were still very much the "head of the household," the fact that her husband supported her dangerous journey is pretty remarkable. In addition to her supplies and survival gear, she also carried along a typewriter on which to file posts for the Columbus Dispatch. Along the way, Jerrie did encounter some issues. Her radio stopped working over Virginia, yet she flew out over the Atlantic then discovered her two direction finders had a 60 degree discrepancy. She decided on trusting one of them, but ended up over-flying her first stop at Kindley Air Force Base, Bermuda. Upon landing, she encountered a strong crosswind that turned her plane in a circle after touching down. When the malfunctioning radio was inspected, it was discovered that one of the leads was unattached, which caused Mock to suspect sabotage. After the radio repair, she flew on to the Azores and Morocco. She was still having trouble with the plane's brakes, so she phoned her husband, who informed her that new brakes had not been installed as originally planned. Oops. During all of this, Jerri's "opponent" Joan Merriam Smith had actually taken off two days before her. But upon reaching Guam, Mock's husband told her that Smith was only as far as Calcutta, and by the time Jerri was back over the U.S. mainland, Smith was still n Australia. Twenty nine days, 11 hours, and 59 minutes after leaving, she touched town once again at Port Columbus, becoming the first woman to successfully fly around the world alone — over twenty five years after Amelia Earhart had set out upon the same goal. Mock received a FAA Exception Service Decoration medal from President Lyndon B. Johnson. Her plane is now on display at the Steven F. Udvar-Hazy National Air & Space Museum in Chantilly, Virginia. WHAT Have You Done to My Baby? "Living in the Age of Airplanes" is Awesome!